The cold temperatures and decreased sunlight of winter can generate or aggravate symptoms of depression —often referred to as Seasonal Affective Disorder (SAD). Symmetry Counseling’s Leanna Stockard, AMFT, introduced this disorder in her blog Understanding Seasonal Depression, where she described some common symptoms. If you are experiencing SAD, there are a variety of helpful treatments you can try. The National Institute of Mental Health identifies the four most prevalent treatment options for SAD as light therapy, vitamin D, psychotherapy, and medication. You can choose one of these treatments or a combination. Shorter days lead to less exposure to sunlight, which can darken moods and disrupt sleep patterns. Light therapy is as simple as increasing your exposure to simulated daylight, which may ease the symptoms of SAD. This treatment involves a light box that mimics the effects of sunlight. Light therapy is usually conducted at home. You simply place the light box in front of you where you can see it while engaging in another activity, such as reading or watching TV. Be careful not to stare directly into the light, as this can harm your eyes. Your doctor should help determine what time of day you engage in light therapy, the duration, and the intensity of your light box. Light boxes can be purchased online or in some stores—but make sure that the light box you choose filters out harmful ultraviolet light. The Mayo Clinic advises consulting with a doctor before beginning light therapy, as this treatment can aggravate certain skin or eye conditions and cause reactions with certain medications. Our bodies make vitamin D when the skin absorbs sunlight. Less exposure to the sun—because of shorter daylight hours and heavy winter clothing—can lead to a decreased concentration of vitamin D in the body, which may contribute to symptoms of SAD. The National Institute of Mental Health reports that low levels of vitamin D have been found in people who experience SAD. This may be due to a lack of exposure of sunlight and insufficient dietary sources of the vitamin, which is found in fortified milk and cereal, egg yolks, and certain fish. Some studies have found that taking a vitamin D supplement might help to decrease symptoms of SAD. It’s important to inform your doctor before taking supplements, however. Also, researchers do not agree about the effectiveness of vitamin D to treat SAD. If you wish try supplements, you might also want to use another treatment method. Symptoms of SAD can be effectively addressed and managed with psychotherapy. If you experience SAD, you may choose to begin psychotherapy in the fall or winter and reassess your need to continue in the spring. Psychotherapy can help you to learn a variety of coping strategies, identify and challenge negative thought patterns, and boost self-worth, to name a few benefits. This can help to improve your mood and relieve symptoms of SAD. 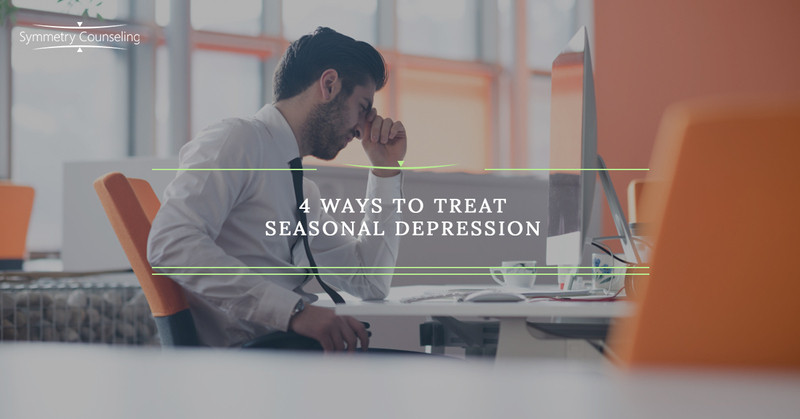 Although SAD comes and goes with the seasons, it’s important to remember that it’s a depressive disorder that can manifest serious symptoms. The National Institute of Mental Health reports that antidepressant medications can be used to treat SAD, particularly selective serotonin reuptake inhibitors (SSRIs). Symmetry Counseling’s Madissyn Fredericks, LPC, wrote a blog titled Antidepressant 411 that addresses common concerns about taking medication. Talk to your psychiatrist or primary care doctor if you’re interested in medication as a treatment for SAD. To begin participating in psychotherapy, contact Symmetry Counseling to schedule an appointment with one of our skilled counselors.